As friends and I drove to a women’s retreat on Friday evening, I made a quick comment about the forest- it looked like it had been clear-cut, and I said so. Today as we drove home, we read signs that told the story. 120 mile-per-hour winds blew through the area a few years ago, apparently damaging the trees to the point that they needed to be removed. The forest was replanted the next year, and with closer inspection (through the car window on winding roads- you do what you can!) I noticed saplings. It reminded me of conversations about people- students and friends- who have mostly-unknown stories. The stories explain why we are what we are and refute the easily-made assumptions about each other. Stories can’t, and aren’t, always known, though. Between miscommunications, professionalism, and a desire to keep private the stories that are not ours to share, and plain old insecurity, errant assumptions abound. In the meantime, I sense my own opportunity to shift the angle of my assumptions. What if, instead of assuming I knew, I remembered the incomplete nature of my awareness? What if I assumed that there’s more to the story? Maybe love would blossom and healing would be fostered. Maybe I could extend grace more automatically and judgement less often. Maybe the greater Story would be better known. The ratio of You(Your) to the people (them) in this verse is 6:2. I wonder what the ratio of God to me is in my reflections on the past. Certainly, there is redemption. His *lovingkindness* and strength do provide leadership and guidance. Sometimes, like the people in this verse, I don’t like the way He leads. That’s my issue, though, not His! This verse is a great reminder that He leads out of *lovingkindness* and strength. 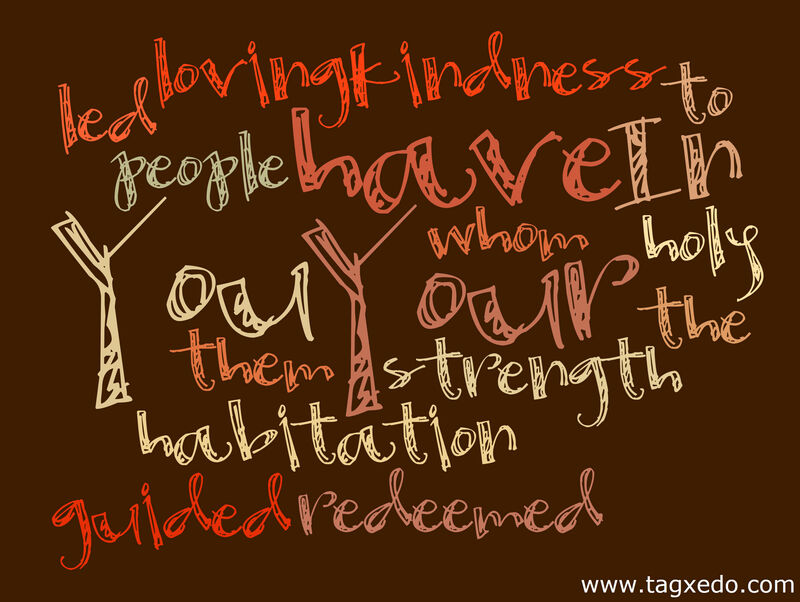 Just for fun, here’s a tagxedo image of this text. When talking requires effort, there’s a lot that isn’t worth it! The words drift through my head, comforting me with their truth. It could be well-argued that my individual satisfaction is not the ultimate goal of God’s work in the universe, but His kindness to satisfy my soul makes me smile to think of it. When the lies of the enemy mount and the injustice in the world seems overwhelming or simple loneliness strikes, He knows. You told me about Jesu who came to live among the fisherfolk, and was nailed to a tree by the skalds and Romans and hung up to die. And I remember thinking, this Hanging God is unlike any of the others; this god suffers, too, just like his people. So when I pray for brothers and sisters around the world and my heart aches for their pain, I too find comfort in the truth that He knows their plight. He is unlike any other. As I finish reading through Deuteronomy, today is the day for chapter 32, aka the Song of Moses. I’ve long thought that the Song of Moses was cool- a nice poetic break from the lists of rules and census figures. What I missed, somehow, is the insurance aspect of the song. …this song will be there with them as a witness to who they are and what went wrong. Over and over again, Moses gives the people of God the “choices and voices” talk about listening to God’s Word and making the choice to obey. This is at the end of 40 years of discipline in the dessert and right after a couple major victories. God knew they would fail- they would not be faithful to the covenant they made with Him- and yet they were His people. It’s love beyond what I could offer. It’s love and mercy I need! Cons: girl is likely caught off-guard (and may be under-dressed or ill-equipped) and loses respect for the guy who accidentally asked her out. **Disclaimer: this post reflects the views of a small number of women and may or may not hold true across the board. As my sister says, “Be a man. Make your intentions clear from the start.” You’ll earn respect for it. connotation in my mind (and according to Wikipedia, in many Christian churches): a statement of praise, due to the fact that the crowds praised Jesus using this term as He rode into Jerusalem. …and how easily I forget my own need, too. So I think it’s time for me to pray, “Hosanna!” a little more often, to think of my own need for Jesus’ work on the cross, the needs of those around me, and the needs of those around the world. I need not be crushed by desperation, but I do need to remember what it tastes like to be catapulted back into rightful dependence on the Savior. Sometimes circumstances bring that taste, and sometimes a wake-up call does it. In either case, hosanna, Jesus, because we need you. The time was around 3:30am on Thursday, and I was hungry. I don’t usually wake up at 3:30, and I don’t usually feel hungry very often at all, even during the day. I eat on a pretty steady schedule, and I usually eat enough protein and complex carbs to keep me full for a while. While this was the first time I woke up in the middle of the night hungry, it wasn’t the first time I felt a stronger hunger than normal in the last few weeks. The only thing I can figure is that a more regular exercise routine (running several times a week as opposed to only when chased or playing with small children) has increased my metabolism, and my body is now informing me of a greater need for sustenance. As I ran this morning, I realized that the same thing is true spiritually. When I am regularly “eating” God’s Word by reading it, meditating on it, praying it, and living it, I long for more. My hunger signals that my spiritual metabolism is increasing, and my desire grows. The less I learn it and live it, the less I feel my need. I’ve started eating more and more often (in part to prevent the mindless-eating-anything-because-I’m-“starving” response). May my desire for the truth of God ever increase, too! I was chatting with some dear friends a bit ago when I used the term “future life.” By this, I explicitly mean the life that I will live in the future; I actually envision some fanciful, lovely-at-every-moment, dream-like existence in which hopes are instantly fulfilled, there is no need for character development, and problems are quickly and easily solved (if they exist at all). My friends were good* enough to call me on my false hope. There is no “future life” as such, even if I’m hoping for one. It is only in my dreams that such a world exists. Some dreams come true, but this one won’t. So maybe my hopes would be invested best in the present as well as the future- what God is bringing to pass as His kingdom comes to earth as it is in heaven and as His will is done. Longing for the day of complete fulfillment seems to be part of creation’s work, but it’s not my only work. *You know friends are good when they call you on such things. Acquaintances let you believe lies for myriad reasons; good friends call lies what they are in kind but true ways.